Listen to me reading the introduction. Why aren’t the most powerful technologies being used to solve the most important problems: hunger, poverty, conflict, employment, democracy, disease, and new complexities faced by businesses? What’s missing? A solution is crystallizing worldwide. Corporations, economists, and social scientists are working hand-in-hand with technologists who are using Artificial Intelligence (AI), Machine Learning (ML), Complex Systems Theory, Simulation, Optimization, Game Theory, and more. But, until now, these arenas have remained separate-from each other. They are too hard to understand and integrate to solve the problems we care about. 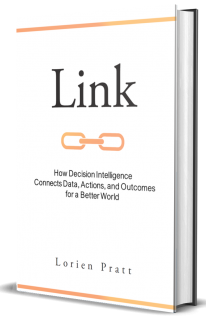 Link is a practical and accessible road map to solving the hard problems, to reclaiming power in this new world, where technology has accelerated beyond our ability to understand or effectively control it. Link brings technology and academic disciplines back to earth, and connects them to our natural way of thinking. More than anything, Link is a handbook to the future, a guide for the ages that connects “head in the clouds” thinking and tools to “feet on the ground” practical steps that you can take: the best actions to solve the hardest problems. We can work together to solve them. We must. After having delivered AI and ML solutions for over 30 years, and based on interviews with hundreds of experts, Pratt has identified systematic gaps between people and data, between people and each other, and which inhibit the effective use Artificial Intelligence and Machine Learning systems. Why should we start with decisions when solving hard problems in complex situations? What is the unifying pattern that is crystallizing amongst thinkers worldwide as we supercharge how we collaboratively solve hard problems in the 21st century? How can you, whoever you are, help? How can the unifying thought pattern be translated into “hooks” that connect us to data, machine learning, AI to solve hard problems? What’s wrong with how we think about AI and data today, and how can we fix it to drive massive business and other opportunities? What is the technique that you can learn in 30 minutes that breaks through decision-making barriers? How is the vision of history’s great thinkers—Buckminster Fuller, Norbert Weiner, Douglas Englebart, Gregory Bateson, Walt Disney, Mahatma Gandhi—unifying with those in today’s vanguard of cutting-edge technologies like Warm Data, Simulation Centers, and more? 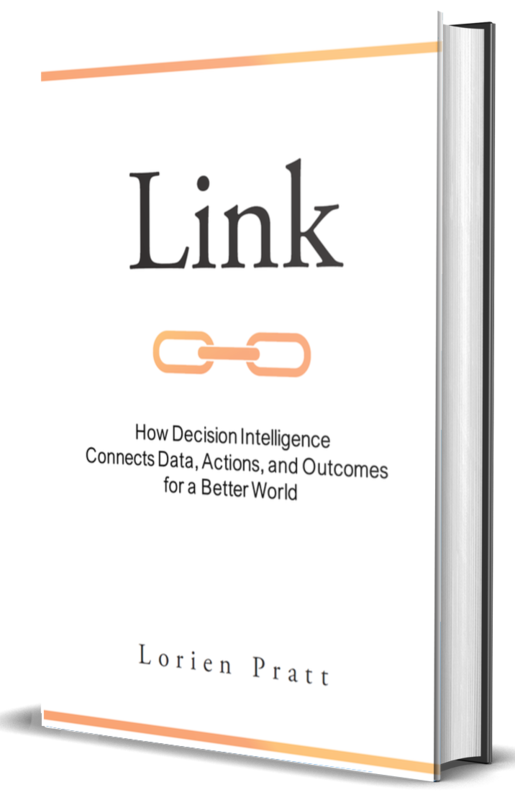 Link shows how the emerging field of Decision Intelligence (DI)—which many experts agree is the next step in the evolution of AI—coordinates human decision makers with data, models, and more. Link explains to nontechnical users how these technologies are being used to support responsible decisions. The Complexity Ceiling: Head hurting from bouncing against complex situations? Here’s why, and what to do about it. Technology Building Blocks to Solve the Hardest Problems: Making the complex simple, so we can use them as tools. Getting Practical: How to break down complex situations into manageable pieces, and how to use advanced technology, evidence, and data (when appropriate) to be sure you get it right. The future of the Solutions Renaissance: What happens next, and how can you help?